Based on Linux platform, DreamBox Satellite decoder is very powerful with many new qualities and features. There are many additional addons installed on it, and thus, it is very user friendly, even for its average users. In fact, the important thing to notice is that the users can set the timer for a recording, as in when it should start and stop, along with many other things without any intervention. 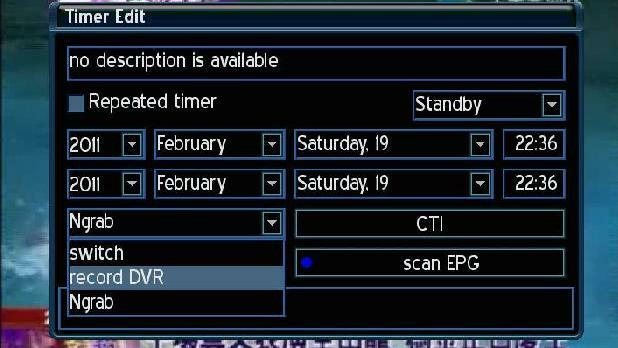 On your remote control, go to Menu >>Timer. Here, you will find a list of Timer and then, press the Green button to set new timer. In the below menu, define a new timer with its description, either for one particular time or for repeated times. Move to the next field and fill up the details about respective date, month, and year and specify a time, as in when you wish the action to take place. To apply the settings, press Green button and save the changes. Once that done, you will notice a new list displayed at the bottom with the Timer. Repeat the above steps for additional timer events. If you no longer want the timer event, use Red button to eliminate the timer settings or press Blue button to clear the entire list.